CF-ODX / 67 in first livery. C-FODX / 67 next "yellow bird" livery. C-FODX at Langley - CYNJ, British Columbia. C-FODX kicks up some spray on the Fraser River. • CF-ODX Ontario Provincial Air Service (OPAS). Delivered 09-Oct-1962. Initially based at Sault Ste. Marie, ON. • C-FODX Province of Ontario, Ministry of Natural Resources. Regd owner was changed. • C-FODX Put into storage at Sault Ste. Marie in 1989. Canx 17-Sep1990. • C-FODX Waweig Lake Outfitters, Waweig Lake, ON. Regd Sep-1990 & 19-Apr-1994. Canx 15-Jun-1995. • C-FODX Wilderness North Air Ltd., Thunder Bay, ON. Based Waweig Lake, ON. Regd 05-Jun-1995. Canx 08-Aug-1995. N644JJ Aircraft Investments LLC., Oshkosh, WI. Regd 08-Aug-1995. Power plant: Converted to Vazar turbine and converted to VIP interior. N644JJ Arctic Aerospace LLC., Pahramp, NV. 05-Jun-2010. Canx 05-Nov-2011. • C-FODX Arctic Aerospace LLC., (Douglas Waugh), Richmond, BC. Regd 12-May-2011. • C-FODX Martini Aviation Ltd., Langley, BC. Based Fort Langley, BC. Regd 19-Dec-2011. Canx 19-Dec-2011. • C-GTMW Martini Aviation Ltd., Langley, BC. Based Fort Langley, BC. Regd 19-Dec-2011. 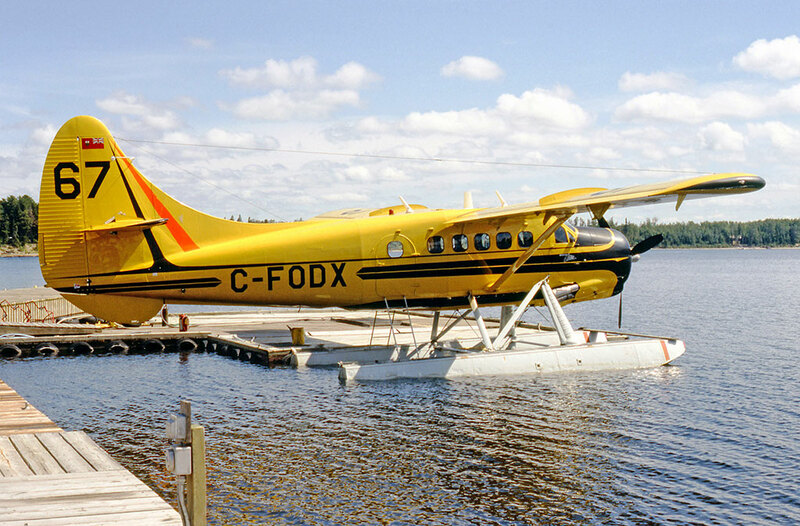 Otter 427 was registered on 10 September 1962 to the Department of Lands & Forests, Government of the Province of Ontario as CF-ODX and was delivered on 9 October 1962 to its base at Sault Ste. Marie. 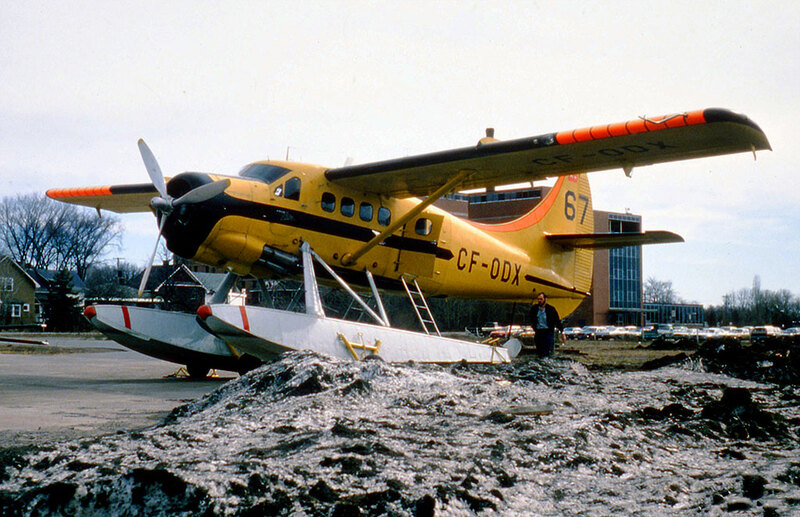 It was one of a large fleet of Otters to be operated by the Ontario Provincial Air Service (OPAS) and was painted in the Provincial Government’s all yellow colour scheme and would serve the Province for many years, providing a full range of bush air services to agencies of the Ontario government. It was one of two Otters delivered to OPAS in October 1962, the other being CF-ODY (429). These two Otters replaced two Beavers, which were sold. The OPAS fleet then comprised 33 Beavers, 10 Otters and one Widgeon. Otter ODX became an active member of the OPAS fleet and by June 1969 had 2,249 hours on the airframe. Between 27 June 1969 and 31 October 1969 its Certificate of Airworthiness was amended to experimental and registration changed to CF-ODX-X for the purposes of “air dropping fire retardant chemicals for experimentation” and this occurred again between 17 April and 31 October 1970. On 4 October 1972 the registered owner was changed to the Ontario Ministry of Natural Resources and it obtained tail number 67 for use in forest fire duties, but continued as before in the service of the provincial government. By June 1981 its total time had risen to 5,894 hours. The following month it was used in the evacuation of Summer Beaver, a Cree Indian settlement on the shores of Nibimamik Lake, five hundred miles north of Thunder Bay which was under threat from a forest fire. Several other Otters and Twin Otters were also involved. ODX, flying from Kenora, did three trips to Webequie and one to Wunnummin Lake before departing to Pickle Lake and back to Kenora, ten hours flying that day to relieve the settlement. ODX faithfully served the province, without mishap, for a remarkable 28 years. ODX and ODW (403) were amongst the last Otters to be operated by the Province and were put into storage at Sault Ste.Marie in July 1989, by which stage ODX’s total time had increased to 8,077 hours. In order to dispose of the two Otters, a deal was struck with Waweig Lake Outfitters whereby they acquired these two Otters in exchange for a Bell 206L helicopter. By Bill of Sale 8 June 1990 the two Otters were transferred to Waweig Lake Outfitters. As they only required one aircraft, they arranged to sell ODW, but retain ODX which was registered to the company on 17 July 1990. Waweig Lake outfitters Ltd., had offices in Thunder Bay but the aircraft base was at Waweig Lake, Armstrong, Ontario. The Otter joined a Cessna 185 servicing fishing and hunting lodges in the Ontario bush country. The company was associated with Wilderness North Outfitters and Otter ODX was very active, its total time having increased to 9,177 hours by July 1994. There were a number of associated and affiliated companies in the outfitting business in Northwest Ontario including Waweig Air, Waweig Lake Outfitters, Wilderness North Air and Wilderness North Outfitters. Together they operated a number of Otters to fly the hunters and fishermen to the lodges. A major shareholder in these businesses was John J. (Jack) Mark, who had founded these companies, and who lived in Oshkosh in Wisconsin and whose own personal company was called Aircraft Investments LLC. By Bill of Sale 8 May 1995 Otter ODX was transferred to this company and a week later it was leased to Wilderness North Air and registered to that company on 15 June 1995. It again flew from Waweig Lake until the lease came to an end on 2 August 1995. At that stage the Otter was transferred to the US register, the Canadian registration cancelled on 8 August 1995 and the Otter registered that day to Mr Mark’s company, Aircraft Investments LLC., of Oshkosh, Wisconsin as N644JJ. Henceforth the Otter would no longer fly customers of these businesses but would be Mr .Mark’s personal aircraft, for his own use. It was converted as a Vazar DHC-3T Turbine Otter and painted in a striking all orange colour scheme with white cheatline. It was based in a hangar at the Wittman Regional Airport, Oshkosh and used by Mr. Mark and his family for fishing trips to the Canadian lakes. It was, for example, reported on CADORS on 1 July 2009 as flying from Oshkosh to Thunder Bay for a summer fishing trip to Canada. This use of the Otter continued for 14 years, until October 2009 and after it had returned to Oshkosh that month after a fishing trip, it was advertised for sale. Since it had gone onto the American register, it had only flown 755 hours, giving quite a low annual utilisation of 54 hours on average, these being the trips to the Canadian lakes. N644JJ was advertised as on Wipline 8000 amphibious floats, with total time of 9,932 hours and with an asking price of US$1,200,000. It was noted at the Vancouver International Airport on 13 April 2010 and was parked there for some weeks. It was again advertised for sale in May 2010, this time by Arctic Aerospace Inc., of Vancouver, with an asking price of US$1,370,000 on wheels or $1,650,000 on Wipline 8000 amphibious floats. 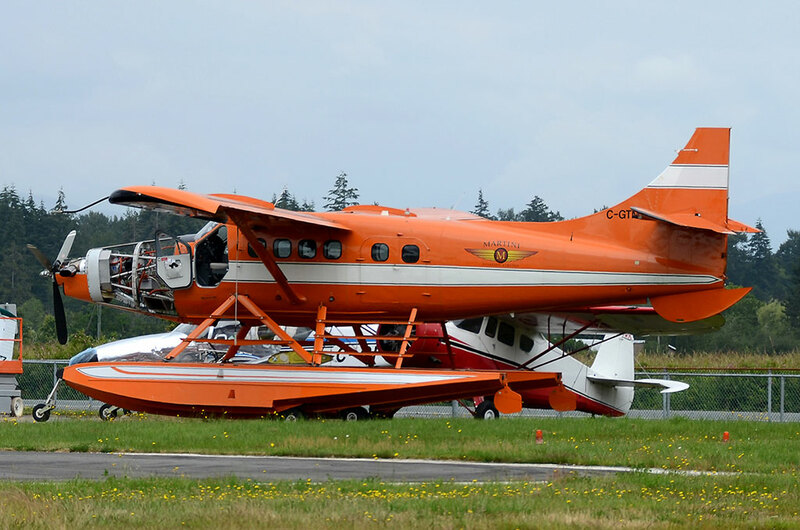 On 6 May 2010 it was registered as N644JJ to Arctic Aerospace LLC., of Pahrump, Nevada but the Otter at that stage was still parked at Vancouver. By 29 May 2010 it had arrived at the Edmonton City Airport. It was at Kelowna mid September 2010 and back at Vancouver by early December 2010, where it would remain for some months in outside storage. 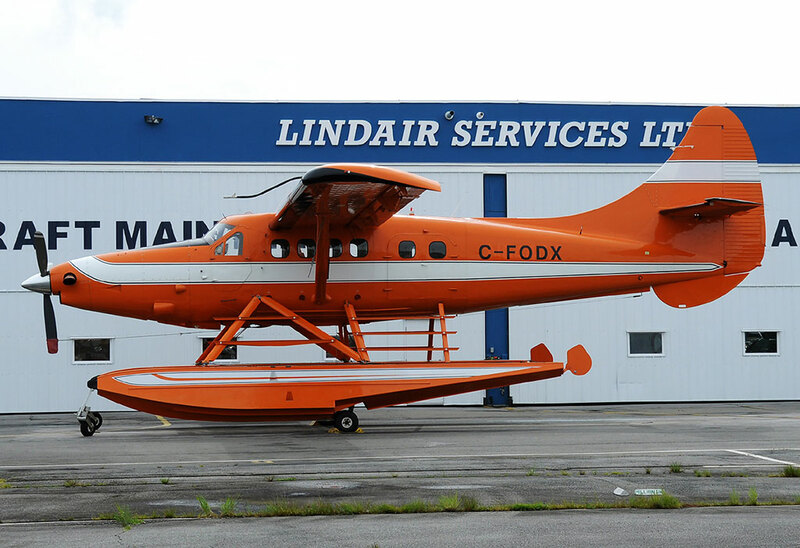 On 12 May 2011 the Otter returned to the Canadian register as C-FODX, registered that day to Arctic Aerospace Inc., of Vancouver and it was noted later that month at the Lindair Services hangar. 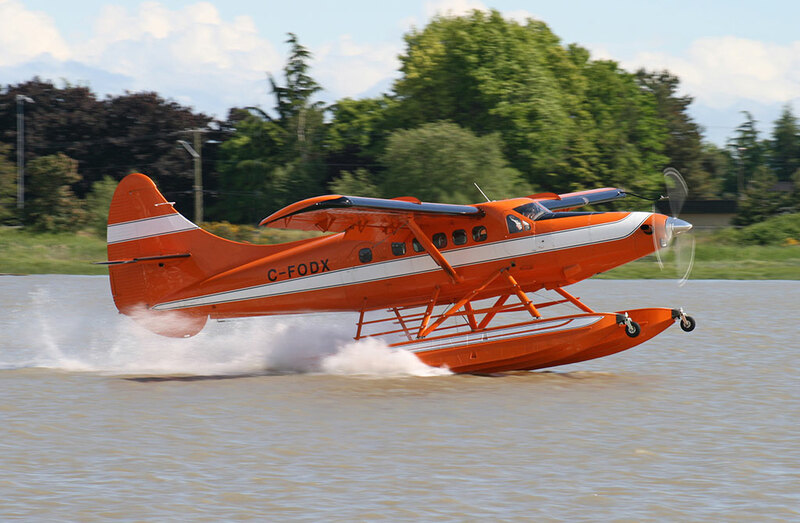 On 17 June 2011 the Otter flew an air test, landing on the Fraser River and was then again in storage at Vancouver. It was again flying on 12 September 2011 and on 15 November 2011 it flew VFR Vancouver to Kelowna. The pilot reported a landing gear indication problem. He made two fly-bys at Kelowna and was advised that the landing gear appeared down and landed safely. The Otter remained at Kelowna for a time and was sold, being registered on 19 December 2011 as C-GTMW to its new owners, Martini Aviation Ltd., of Langley, BC. Martini Aviation Ltd., is the company of the Martini family, owners of the Fort Langley Airport, where the Otter is based along with their other aircraft, including a Beaver, Turbo Beaver, Augusta 109 and Pilatus PC-12. The family is active in the construction industry, particularly supplying tiles and windows and the aircraft are used to move people and cargo to job sites, as well as for recreational use. The Otter was flown to Pitt Meadows, BC., where in the hangar of Maxcraft Avionics a new instrument panel and avionics suite was installed, including Garmin G620 and GTS800 traffic avoidance systems and a Century 2000 autopilot. It was then returned to the Fort Langley Airport and into service with Martini Aviation. It retained its all orange colour scheme from the previous owner, with Martini Aviation titles. In April 2015 C-GTMW was advertised for sale as “Best equipped DHC-3T available”. It featured a high specification avionics suite, Baron STOL, Wipline 8000 amphibious floats and a PT-6A-34 engine. Total time was 10,147 hours and asking price $1,650,000. The Otter did not sell but continued in service with Martini Aviation, and was still flying for the company in summer 2015.